781 seems broken even though this happened late in the day, and could be reversed within an hour or two. Assuming it is confirmed, the next target is in the low 790s now. Again, the MTFS pattern is not the clearest we've had, so we just have to wait lines finally join. We may have the same kind of wavy climb until the major resistance is reached. It is now proabably too late to see a significant retracement, but one should see continuation of the high volatility environment with possible pauses on the way to 812. Same comment as for NDX. SPY surprisingly passed the 150 level late in the day to almost hit PR2 (151.06). We now have to wait until the MTFS pattern completes in overbought territory. We are in between decision points and the pattern certainly isn't the easiest to read right now. 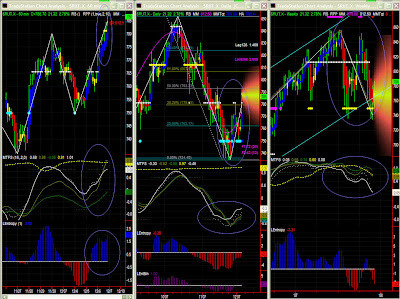 while an upper bias is obvious, congestion on Fib or MM level is more than possible. Daily: up, but behaviour on 151 must be watched carefully. As said above, SPY almost reached PR2 (61.8% Fib retracement). MTFS is fairly bullish now, and one can only be a little frustrated it never completed the previous down pattern (crossover in oversold territory). It seems a little too late now to see a substantial retracement, but a pause is quite possible. Uninspired commentators will say that some economic news fueled a 2-day rally, and allowed NDX to prematurely reach a major resistance level in the short term (60mins). The truth is that there are indeed occasions of spurrious volatility which turn targets into attractors. While difficult to detect, such self-induced momenta generally do happen when there is virtually no upward or downward pressure to control them. 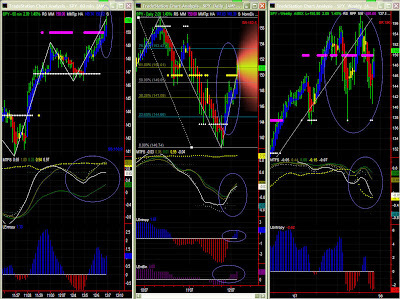 Intraday traders will have switched to a 15mins chart, while our interpretation remains within the scope we had in mind. More important is what's coming next now that NDX has reached that key level. 60mins: Upper bias, but behaviour on key resistance level may cause some congestion. The MTFS pattern has not been the easiest to read, with that second bout of rallying starting from median territory. Such moves generally carry little energy, hence it is surprising NDX reached its resistance level so quickly. 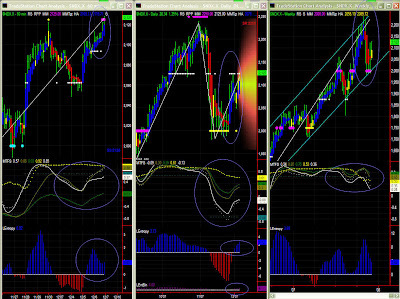 Now the pattern has to complete somwehow with lines joining either in overbought territory... or oversold territory. At this point in time, volatility is high in a market that is looking for a pause. Current target [2125-2133]. Possible longer term target [2185-2190]. Despite this 2-day rally, the MTFS pattern is showing moderate signs of weakness,and while Entropy has been increasing, LEntBin = 4, so is quite high. That would tend to predict if not a retracement, at least a pause in the coming days. Longet term, the 2250 targetis back on track. In the short term, targets would be easier to predict if MM and Fib levels somehow coincided, but no luck this time... It is not clear whether the upper bias we still have will bring NDX a little higher (2140?) or whether a period of congestion is imminent. No retracement in sight just yet, but we'll have to watch Entropy over the next few days. NDX is half-way in its channel again. We don't have a blue bar yet though. Surprisingly enough, 2000 is still a major resistance level at this time frame.